With its French inspiration, all building materials for the Notre Dame Basilica were even brought over from France. Whether you simply view it from the exterior or take a trip inside, it’s quite the sight. Many brides will come and have their photos taken outside the church, whether or not they were married there! The surrounding parks are extremely popular with locals, so pack a snack and take a rest on the grass. 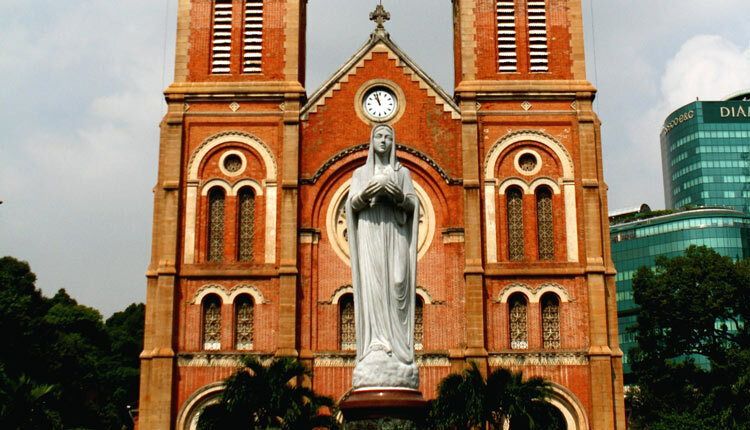 Situated right in the heart of Hochiminh City is the most famous landmark as well as core Cathedral of the city, Saigon Notre-Dame Cathedral (translated as “Nhà thờ Đức Bà Sài Gòn). Notre-Dame Cathedral, or Notre-Dame Basilica to be exact, is a famous age-long cathedral in Southern Vietnam. 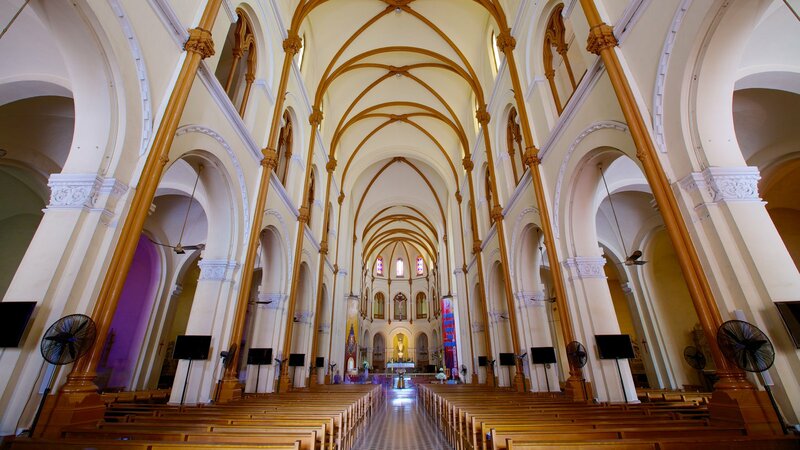 It is a magnificient building located at the paris Square in Hochiminh City downtown, attracting not only Catholics but also most tourists for its neo-Romanesque style architecture and a sacred atmosphere. The first church was built on Rue 5 (today's Ngo Duc Ke Street). This had been a Vietnamese pagoda, which had been abandoned during the war. Bishop Lefevre decided to make this pagoda a church. In 1959, Bishop Joseph Pham Van Thien, whose jurisdiction included Saigon parish, attended Holy Mother Congress held in Vatican and ordered a Peaceful Notre Dame statue made with granite in Rome. The city named this statue as Santa María Reina de la Paz, which shows that the country, involved in several wars, craves above all peace. 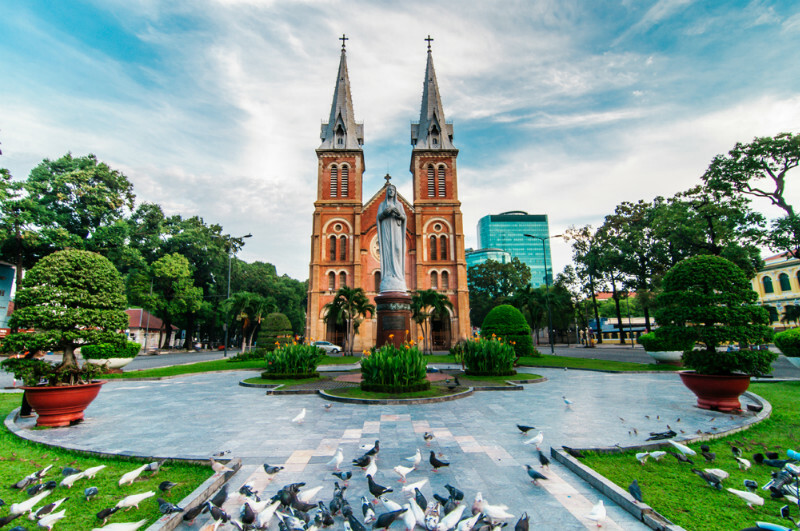 When the statue arrived in Saigon, on February 16th, 1959, Bishop Pham Van Thien held a ceremony to install the statue on the empty base and presented the title of "Regina Pacis". It was Bishop Pham Van Thien who wrote the prayers "Notre-Dame bless the peace to Vietnam". On the following day, Cardinal Aganianian came from Rome to chair the closing ceremony of the Holy Mother Congress and solemnly chaired the ceremony for the statue, thus the cathedral was then-on called Notre-Dame Cathedral. The cathedral boasts its honored status as a Basilica consecrated tens of years ago. In 1960, the Vatican founded a Roman Catholic dioceses in Vietnam and assigned archbishops to Hanoi, Huế and Saigon. Notre-Dame cathedral was titled Saigon Chief Cathedral. Yet, in 1962, Vatican anointed the Saigon Chief Cathedral, conferred it basilique in honor of the tri-cenetary of the Bishopric of Saigon. Since then, this cathedral was called Saigon Notre-Dame Cathedral Basilica, which has enhanced its value and absorbed hundreds of thousands of catholics as well as international tourists to pay a visit. Apart from the religious meaning that attracts tourists, the even more special captivating point of Notre-Dame Cathedral is its special neo-Romanesque style of architecture. During its construction, all its red bricks were imported from Marseilles and colored glass windows made in France’s Chartres Province, France. Tiles have been carved with the words Guichard Carvin, Marseille St André France (perhaps stating the locality where the tiles were produced). Some tiles were carved with the words “Wang-Tai Saigon.” Many tiles have since been made in Saigon to replace the broken tiles caused by war. There are 56 glass squares supplied by the Lorin firm of Chartres province in France. The cathedral foundation was designed to bear 10 times the weight of the cathedral. In front of the cathedral is a statue of the Virgin Mary. On a whole, the neo-Romanesque architecture and two 58m-high square towers tipped with iron spires dominate the city’s sky line, creating a beautiful religious site! 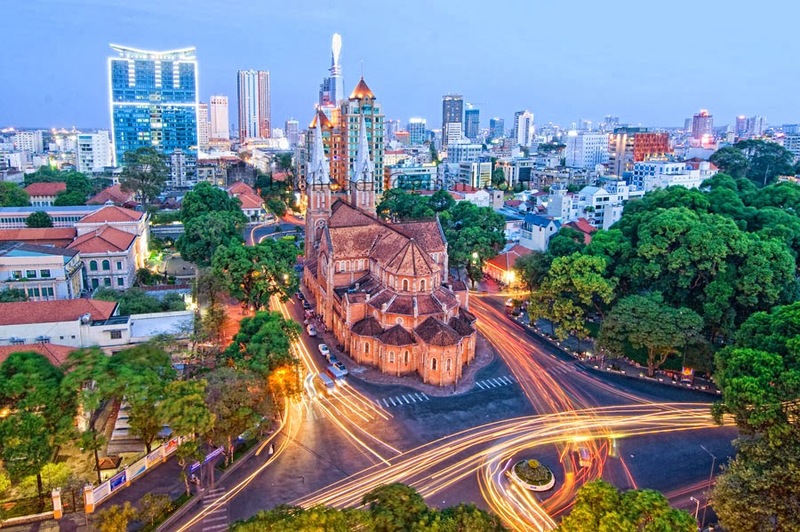 Set amidst the active and continuously moving Saigon, the Notre Dame Cathedral is considered a stop for seekers of old beauties and calmness as well as one of the most popular tourist attractions in Ho Chi Minh city. The Cathedral of Notre Dame is located in Cong Xa Paris square, or as you would write a Vietnamese Cong xa Paris (see map of Saigon). This is the 1st district, the center of Saigon. Nearby we have the Reunification Palace, the Opera House in Saigon, the town halletc.